I think a significant amount of praise that I’ve heaped on the first two installments of Spider-Gwen was predicated on the belief that an issue on the level of Spider-Gwen #3 would soon be published. Since the book launched in February, there have been a fair number of people carping about its slow(ish) pacing and odd character choices. But in my two reviews, I’ve maintained that creators Jason Latour and Robbi Rodriguez were still in the process of developing their world and warranted a little bit of patience. What mattered to me was that the book’s distinctive narrative voice and aesthetic, along with its unique spin on familiar characters, were still front and center, meaning that some magic was bound to happen when heavy doses of dramatic action and tension were eventually sprinkled in. 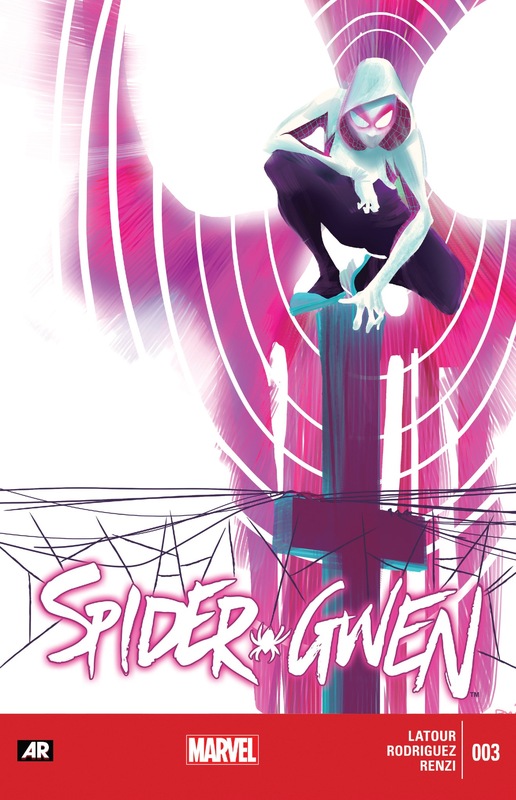 Spider-Gwen #3 pulls so many things from the first two issues together, meaning Latour/Rodriguez have delivered a hell of a riveting story filled with some very surprising turns and engaging character moments. From the opening interaction between Gwen and her father, to the comic’s final lonely visual, which is marked by the debut of this alternative world’s version of Ben Parker, I was undeniably gripped by the comic and can safely say I have absolutely no idea where Latour and Rodriguez are going to take us next (and may I add, hopefully this is one comic that is allowed to breathe during Secret Wars, but I honestly don’t trust Marvel to leave well enough alone). 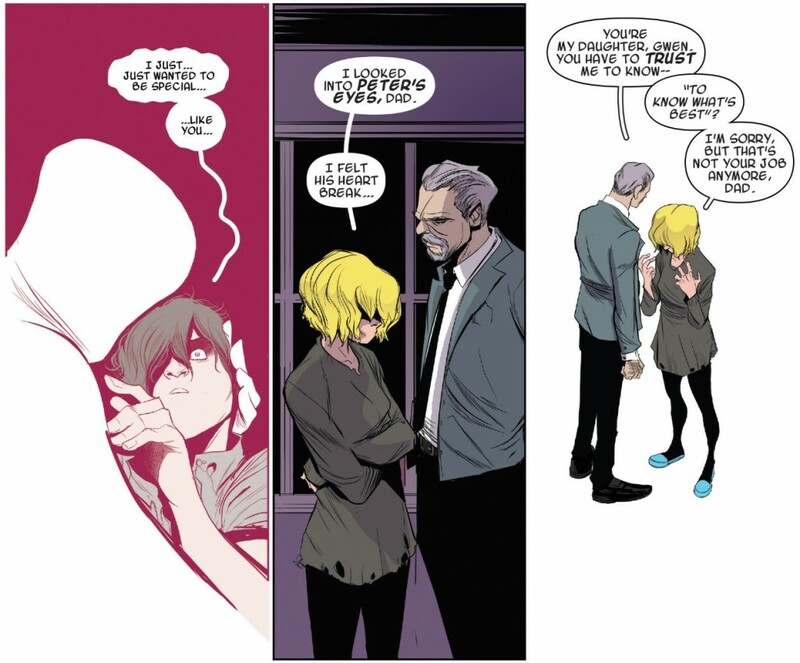 As part of my write-up of Spider-Gwen #2 a few weeks back, I mentioned that I believed Captain George Stacy might emerge as a very valuable supporting player in Latour’s larger narrative. Using Captain Stacy as a parental authority figure in an analogous Spider-Man story creates such a unique dynamic based on the character’s known intellect, pragmatism and general like-ability. A character like Stacy just did not exist in the original Amazing Spider-Man. Yes, I understand that the 616 Universe does have a Captain George Stacy, but despite sharing the same name and some characteristics, it’s Stacy’s relationship to the costumed, super-powered titular character in the series that ultimately distinguishes him in the world of Spider-Gwen. In many ways, Captain Stacy is Spider-Gwen’s version of Uncle Ben – a wise, father figure who imparts unsolicited advice to the young protagonist. But unlike Ben, Stacy lives (for now) and continues to be a player in his child’s life, witnessing first-hand, the constant danger Gwen is putting herself in. He attempts to console her in that she can’t just keep blaming herself for Peter Parker’s death (which is, undoubtedly, Gwen’s “Uncle Ben moment”), but Gwen returns Stacy’s fatherly chat with a speech that shares some striking similarities to Peter’s “power and responsibility” mantra. She stops short of calling her secret identity a curse, but it is absolutely a burden and something she would love to live without if she didn’t feel so obligated, so responsible, for saving more innocent people like her high school friend Peter. It doesn’t hurt that Captain Stacy is also an edgier version of Ben – fully capable of taking care of himself AND protecting others, which makes his daughter’s secret life all the more terrifying for him. The city is filled with bad guys and supervillains, but Stacy is fully equipped as a member of the police force to solve this problems through proper channels of authority. Instead, he has to carry around the knowledge that his daughter is secretly working in a role that subverts his authority. Even after Peter comes clean to Aunt May in the 616 (before “One More Day” inevitable reversed it), this dynamic interplay between Peter and his parental figure never exists. And Latour and Rodriguez seem unafraid to explore every awkward and dramatic crevice the Gwen/Captain Stacy relationship presents, whether it’s Gwen stupidly suiting up after the Vulture breaks into her home, or her having her mask removed during a battle with Frank Castle. 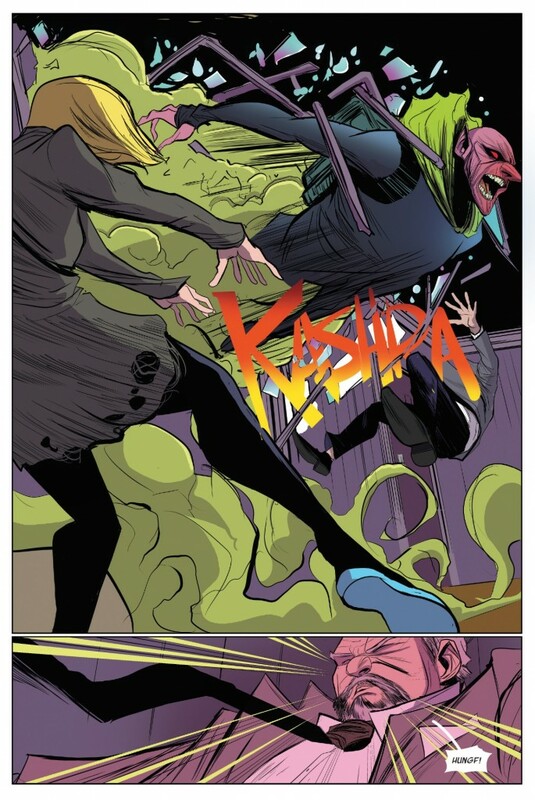 Speaking of Castle, everything Spider-Gwen #3 does with his character is absolutely wonderful and welcomed. Watching Castle show up at the Stacy household donning the classic “Punisher” t-shirt, while also demonstrating Frank’s trademark lone wolf-streak and violent vigilante nature is the perfect nod to the character’s roots. Yet, Castle in this world is a recognized officer of the law, which makes his blatant sociopathy all the more terrifying. There is nothing more nightmarish than an unhinged authority figure, but rather than find some corrupt cop or politico to head the police force a la Gotham or some other books, Latour and Rodriguez give us a unique spin on the Punisher. Spider-Gwen is definitely a book on the upswing right now, and there are still plenty of characters and associated dynamics (Matt Murdock, Ben Parker) that remain unexplored. Latour and Rodriguez have smartly provided themselves with plenty of latitude in the world-building department. I’m hopeful that some of the “I’m disappointed” complaints will start dying down over the next few weeks. Wow. So they’re stepping up with Castle basically de/e-volving into the Lock Up character from Batman:TAS. Nice, and very appopriate. Best thing they’ve done “to” Gwen since #121.